Room is an exhibition featuring work by Cori Champagne, Joan Harmon, Justine Johnson, and Lindsey Wolkowicz, delving into the relationships between the physical body and the architecture which positions it in place and time. Employing sculpture, installation, video, and painting, these artists consider the body and its relationship to environments both urban and natural. How does place define us? What can we learn about ourselves through our connection to the spaces we occupy? 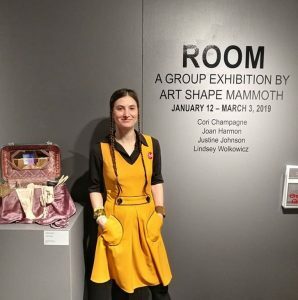 Curated by Amy Joy Hosterman of Art Shape Mammoth, Love this photo of Amy with my work ‘Train Case’ on the opening night.